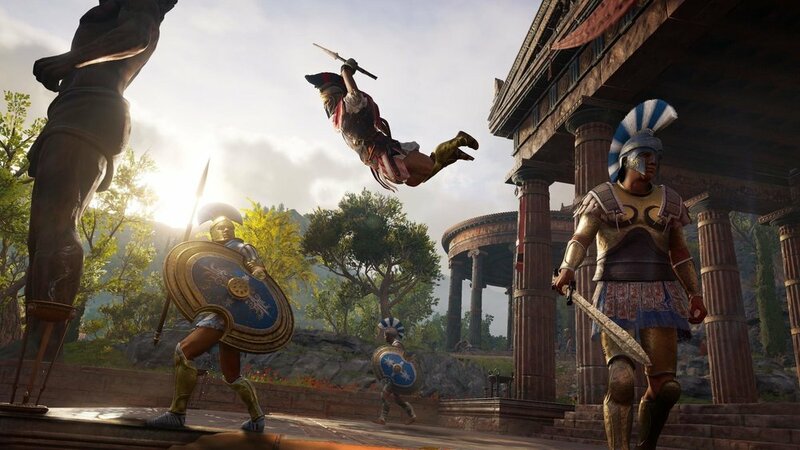 Ubisoft’s upcoming Assassin’s Creed Odyssey continues the open-world RPG direction from Assassin’s Creed Origins, but this time sets the action in 5th century B.C. ancient Greece. I recently had the opportunity to try a demo at a Ubisoft preview event and came away wanting more. Assassin’s Creed Odyssey will focus more than before on its RPG elements, including player choices. From the outset, as a first for the series, I could choose to play as a male or female, Alexios or Kassandra, respectively. I picked the strong mercenary woman Kassandra. Following that, I was free to either head towards a quest or roam around the island. I began a quest to help a woman whose girlfriend mysteriously went missing. During my conversation, I encountered several dialogue options and could fashion my character’s personality as kindhearted or rude. Although I couldn’t go back and change what I’ve said to see how my answers affect the story, Ubisoft has confirmed that choices matter and shape the main character’s journey. Immediately after my conversation, I entered combat. In this particular demo, I was at level 50 and in a later-game area. As such, enemies were scaled to my level. In turn, I had access to stronger abilities, which otherwise may have taken significant grinding and proper planning of the protagonist’s skill trees. Battles are more fast-paced and dynamic than you might expect. Instead of blocking with shields, I found myself dodging and parrying enemy attacks before unleashing my own power. After a few hits, I built up my ability gauge and eventually let loose an aggressive flurry of hard-hitting strikes ending with a jumping smash that shook the very foundation my foes stood on. The flashy, powerful hits produced an adrenaline rush, and I was eager to take on multiple opponents at the same time to test the limits of my skills. If I wasn’t careful, though, my attacks killed innocent civilians, which caused a bounty to go on my head, inviting other mercenaries to take me out. Again, choices come into play here. You could pay to get your bounty mark removed, like I did, or engage opposing mercenaries as they appear. Once I made it via horseback to the temple where the missing woman might be, I realized I would need to complete a few subquests to get inside. One subquest found me utilizing Kassandra’s impressive climbing capabilities to scale monstrous mountains in order to seek help from an ally mercenary. In the other, more interesting subquest, I steered a boat to another island to retrieve a key from a dangerous warrior tribe. While on the boat, I partook in a naval battle, which returns once again from previous games. Despite my ship’s large size, I was able to speed up and dodge opposing ships as needed. It was enjoyable retaliating with fire arrows or straight-up ramming into their boats. My naval warfare experience was minimal during the demo, but given the abundance of seas between the numerous islands, this will likely be a big part of the game. Once I finally made it to the tribe, I refocused my efforts into stealthily achieving my mission to retrieve the key. This involved using my trusty eagle to scout out the area and mark waypoints, and carefully sneaking around to avoid being ambushed by the tribe. During failed attempts when I did get caught, I still did my best to find cover, and shoot arrows from afar. Alas, I could never find an effective way to rush in and kill, Rambo-style. I was better off crouch-walking slowly and assassinating opponents from behind. Once I found the cave holding the key, I was surprised to find a sleeping bear. Taking down this wild animal was more difficult than I had imagined, and I had to outwit the beast by finding higher ground. Indeed, Ubisoft confirmed that animals will play a part in Assassin’s Creed Odyssey, whether you choose to hunt or tame them. 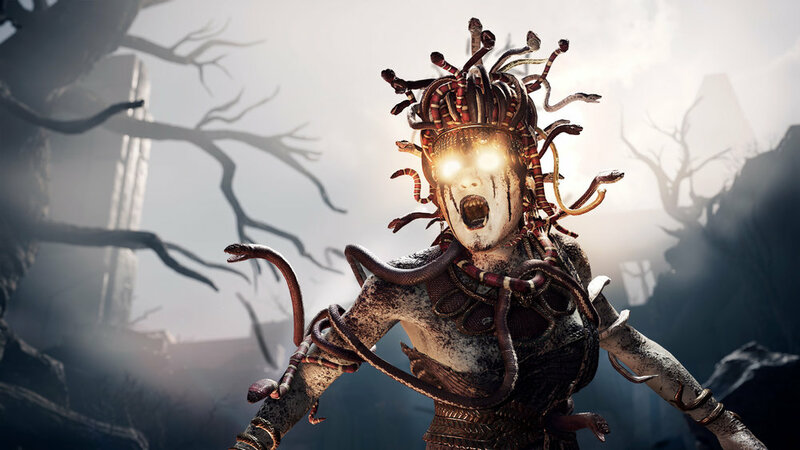 Ubisoft also stated that there will be creatures based on Greek mythology to go along with the setting. My demo ended with a boss fight against one such being: the legendary Medusa. It was an exciting encounter, in which I had to carefully get around the gorgon’s petrifying lasers and annoying henchmen. It was a wonderful bookend to my adventure over lush greenery and fierce seas. My short foray into ancient Greece left me wanting more. Although I liked being a level 50 powerhouse, I couldn’t help wondering what it would have been like to make the customization and dialogue choices that led to that point. Players can synchronize into the world of Assassin’s Creed Odyssey when it launches on October 5.